This is the first installment of a four-part series about options Greeks that will appear on Market Insights between now and Labor Day week. Some clients may be confused by options, especially their use of Greek letters. Delta, gamma, theta, and vega. How to remember what they mean? Fortunately we have some tips that might help you understand and trade with more confidence. Let’s start with Delta: D is direction. Delta shows how much an option follows the direction of the underlying stock or ETF. Delta is expressed in cents. Delta can be negative or positive. The screenshot below shows September options for Apple (AAPL). Calls have a positive delta because they move in the same direction as AAPL shares. Puts are just the opposite, so have a negative delta. The 200 calls have 0.84 delta. That means they’ll appreciate $0.84 if AAPL shares rise $1. The September 225 puts have -0.81 delta. That means they’ll appreciate $0.81 if AAPL shares drop $1. You will notice deeper-in-the-money options tend to have bigger delta. In other words, calls with lower strikes have deltas closer to 1, and puts with higher strikes have deltas closer to -1. This means they will track movements in the underlying more closely. 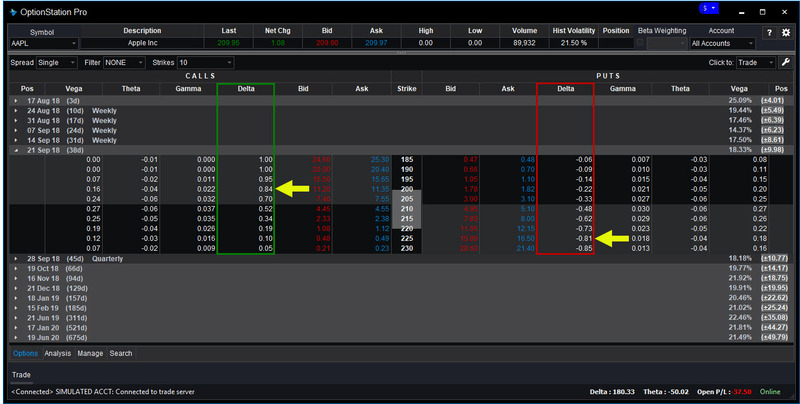 OptionStation Pro showing Apple (AAPL) September contracts, pre-market pricing. There are trade-offs with everything, of course. Deeper-in-the-money contracts with more delta cost more, which can reduce leverage on a percentage basis. (Next time we’ll consider ways to balance that off with gamma.) They also tend to have wider bid/ask spreads, which increases transaction costs. Another aspect of delta is that it theoretically shows the probability of an option expiring in the money. However this is less important for clients looking to profit from directional moves up or down. So how to apply delta to your own trading? It’s relatively simple to start. If you’re bullish on a stock or ETF, you want to be “long delta.” In the case of the AAPL September 200 calls, buying 1 contract will perform similarly to owning 84 shares. Now consider the leverage. A single contract is offered for $1.12 and controls 100 shares, so would cost $1,120. AAPL shares cost about $210 at the time of this writing, so buying 84 would cost about $17,600. In other words, you can control 84 AAPL shares for just 6 percent of their face value. Puts offer a similar kind of directional leverage. The September 225 puts cost $16.50, or $1,650 for a single contract. If AAPL stock declines to $199.50, a single put would appreciate by $850. That would be profit of roughly 50 percent from a 5 percent move in the shares. One last benefit of using options in both cases is that risk is defined and limited up front. Buyers can only lose their initial premiums. That can be safer than other techniques like buying stock on margin or short selling. See our Knowledge Center for more. In conclusion, beginners to options should remember the simple rule about delta: D is for direction. It’s positive for calls because they follow the underlying, and negative for puts because they move in the opposite direction. Traders looking to speculate on direction can use delta to anticipate how options will change in price. Next time, we’ll focus on the related concept of gamma. Disclosure: Options trading may not be suitable for all investors.